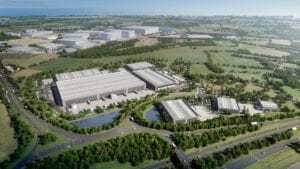 Work has started work on the second phase of speculative development at St Modwen Park Tamworth after North Warwickshire Borough Council gave planning permission for 480,000 sq ft of space. The 35-acre site will house a 318,500 sq ft industrial and logistics facility which is due for completion in December 2019. Development of Phase 1 of St Modwen Park Tamworth started at the end of 2018 and is due for completion in early July 2019. It will produce three warehouse units ranging from 12,000 to 49,000 sq ft.
“As our largest-ever speculative build, St Modwen Park Tamworth will become a major warehouse development and a key employment site for the Midlands,” said St Modwen property director (Midlands and North) Guy Gusterson.